Go here to read the first part of this two-part essay on the American Bookstore. 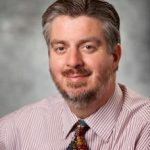 Several hours before a home game at the University of Michigan, the owner of a bookstore on a crowded street teeming with shoppers leaned back from the map he had been drawing on the back of a bookmark and shook his head. “I have something better in my apartment,” he says. 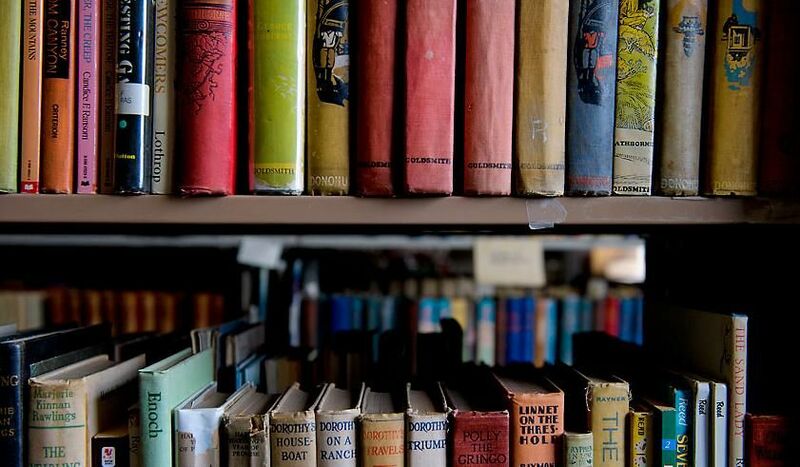 “Watch the shop for a moment, would you?” With that he left a stranger alone in his store, which was stocked with pristine used books of exceptional interest to a collector. Why? So he could offer me a clearer guide to his competitors. He returned a few minutes later with a detailed map of the best bookstores in town and encouraged me to take the weekend to visit them all. It may seem impossible to believe, but the logic of the small used-bookstore owner is different than the logic of the market. It is born of love of home and the desire for communion with the particular and other. As the national landscape is engulfed by a seemingly permanent state of Silicon Valley-imposed liminality, where change disrupts and all must be changed until the only thing left to change is the desire for change itself, one asks: what of the American bookstore? It is not so much that we cannot sit still long enough to read–we can sit still with our phones, after all–but can we sit still to listen to one voice rather than ten thousand? What does communion mean in the Age of the Rolling Microchip? Marie Kondo, guru of the “don’t be afraid to grab another trash bag” movement, recently drew ire from book-lovers. Kondo recommends we keep no more than 30 books in our homes, 30 books that “spark joy.” But who is to say what sparks joy today will spark joy tomorrow? The toy a child receives Christmas morning will be under the couch by Candlemas; the photograph of unsmiling family members hung upon a wall may be passed without thought for twenty years, until one day a bell rings in the heart: these people are part of my story; or, rather, I am part of theirs. A well-managed bookstore becomes a landmark of our spiritual, emotional, and mental lives. There is a line between hoarding and reckless waste. Moss does not grow on a dumpster heap, only mold. But neither does moss—that beautiful bit of magic once deemed a sign a home had been made upon the world and a place truly loved—come forth where all space for texture and love has been denied. Can memory or thrift spark joy? Do we mistake joy for the thrill of possession of an image of ourselves? What if joy is something that steals upon us after years of attention, of quiet care, of preservation, until we find that through devotion the light has turned the clay dirt beneath our feet into moss? Memory goes deeper than thrill, and it takes time to understand. A bookstore is the same way. A well-managed bookstore becomes a landmark of our spiritual, emotional, and mental lives. The great American bookstores are not way-stations for rolling stones, indistinguishable from one town to the next. There are enough of those. In every suburb can be found the warehouse for mass-market publications and e-readers, aisles and aisles of bargain-priced books shoved alongside toys and trinkets. No thought is spent on the books themselves; they are mere items to be shuffled and dusted. Nor are the great bookstores odes to display management, where the point of a book is to have the wealthy consumer part with seventy dollars after matte covers “spark” the lust of possession. A fine bookstore makes a home for the great forgotten virtue: attention. It is not subjected to the whim of stockholders and committees, eager to dump stock in favor of digital innovations. It is curated, but not minimalist. There is texture, there is age, there is the joy that comes of having known something for more than a season. There will be threadbare green carpets at times, or drafty floors in crumbling warehouses. Sometimes it will be a little musty and the owners may be snappish; no cult of smiley salesmanship or being hunted down by helpful handlers in the neighborhood landmark, and no risk of the whole catalogue being dumped at the whims of an administrative team. There will be chairs with a ripped seam, couches with an ugly but familiar sag. There will be philosophy, history, and theology sections stacked with more than self-help or Joel Osteen books. These are the personal peccadilloes animating the creation of my list of favorite bookstores. Of course, the great trouble with such a list is that people are bound to feel left out. We look to lists as a way of authenticating our experience, and this same urge creates the great flattening. As local communities are hollowed out, we recreate that feeling of participation and being known by transferring attention to the Brand we all know. There are few people left with whom I can share memories of a long-gone cottage bookstore on Cape Cod; nearly everyone my age recalls Borders. Yet it was through the dominance of those brands that we lost the face-to-face relationship. There’s the conundrum. 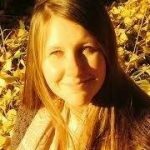 We sacrifice the face-to-face relationship in order to all feel known, and yet who really feels good being one of 10 million likes, one of 5,000 reviewers? Perhaps happiness begins by accepting sometimes we won’t be known; sometimes the hidden treasure really will be hidden away. 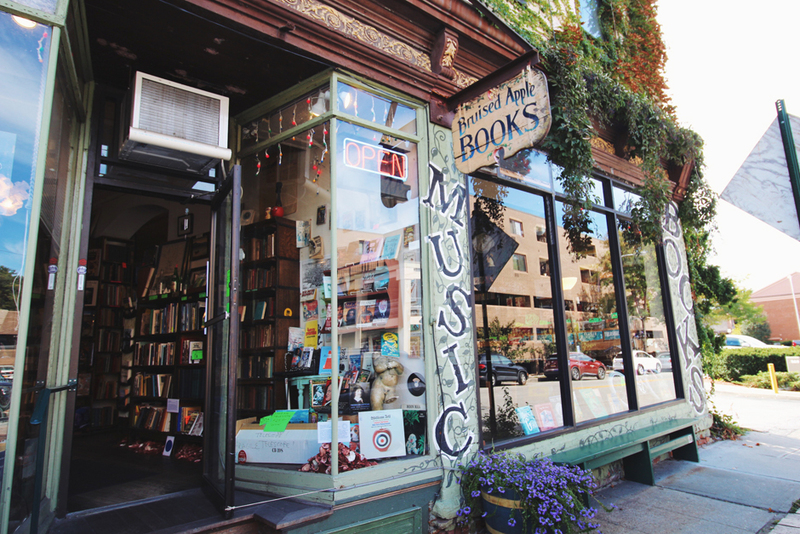 There should not be a penultimate “Best 100 Bookstores in America” list. Who could possibly know a bookstore so well as to know 100 of them? I could never trust such a list nor such a list-maker. All I can do is offer my favorites, built upon imperfect memory, for you to consider alongside your own recollections and things-held-dear. If we approached bookstores in this way, with the desire to have many various plants in a garden, and many gardens across the land, rejecting monoculture, then it would not matter what was “best” at all. There would be no such thing as a list like this; as C.S. Lewis would say, there is no such thing as bad weather. Let us build such a world with no such thing as a bad bookstore; merely many different ones. All that is to say there are bookstores I would love to visit not listed here. I passed through Wichita in a snowstorm one evening and did not wish to risk traveling in increasingly treacherous conditions, and this is why I have yet to visit the famous Eighth Day Books. There are bookstores that would have been near the very top of this list, like Trip Taylor Bookstore in Boise, Idaho, but they have fallen and speak no more. There are small towns like Eureka Springs, Arkansas with wildly weird bookstores, but I have not spent enough time there to justify their inclusion. And, maddeningly, there’s The Book Thing near Baltimore (which has one of the best book scenes in the country) which I have not visited, but where every book is free. Talk about an experiment which deserves our attention! There are cities which may seem neglected; this is called the “Houston has no excuse for being the greatest city in the country and having almost no copies of Iris Murdoch” problem. No one can have spent more time trying to dig out good bookstores in Houston, but in the end they remain only passable. Tiny little Marfa, with its one bookstore, is superior, and it’s surrounded by hundreds of miles of empty West Texas highways. Then there are cities where I’ve visited most of the bookstores but missed a place I’m told was a treasure beyond worth, or so many years have passed that the name has faded from memory. Though they are absent from this list, I pray they do not go gently into the night. 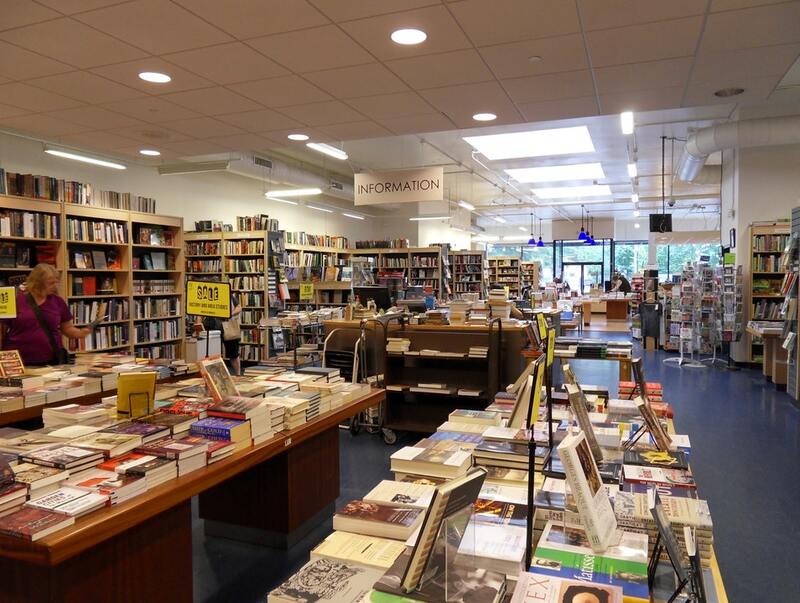 Used and independent bookstores are the true resistance against what Russell Kirk called “the enemies of the permanent things,” the resistance against all which would sand us down and dehumanize us; against that which praises satisfaction and comfort over communion and encounter. How can one encounter that which human hands have barely touched, a throw-away coffee table book meant to be replaced next season? But the faces of these owners, the roaming cats, the tumbling piles, the derisive notes pointing to certain sections if you so dare, the odd hours, the employees who tell you the whole history of a street or draw you a map to the other bookstores in town, the yellowed editorials stapled to a wall, the $2 copy of a rare Kierkegaard that the owner himself tells you is a treasure beyond worth: these were the best memories I brought home of America. What else is a book, and thus a bookstore, but the story of how we got here and how we found the world? No sandwich, however well-crafted, tells the story so well. Food passes but the books remain, at least for a little longer than an afternoon. The bookstores of this list, and the dozens which I did not have room for, are the zenith of our heritage. Treasure them as even dirty green carpets and hulking parking garages, however mundane they may seem, become invested with something human after much use. When they’re gone, they’re gone. #30: Yes Books, Portland ME. This is a messy maze of a used store, with the obligatory stacks and piles making aisles within aisles. The selection is peculiar, the art bizarre, and it is much fun. #29: Green Apple Books, San Francisco CA. A great selection in one of the country’s best bookstore cities (yes, it is frustrating that a city which is part of the creative disruption movement has managed to hoard so many good bookstores but who could expect it would be otherwise). It boasts an excellent mix of used and new, is well-curated, and has a pleasant atmosphere. #28: Dauphine Street Books, New Orleans LA. There are bookstores in New Orleans which preserve a sense of timelessness, mahogany walls and wool-carpeted floors where the sound of a footstep is swallowed up and all that remains is Faulkner. There are bookstores where the light off the Mississippi comes through the windows, and the sound of steam barges roll in (at least in the imagination). But Dauphine Street is New Orleans at its most touchable, a non-Disneyfied version of the city, a memory of the days when the French Quarter wasn’t just Airbnbs. Treasure it. #27: Bruised Apple Books, Peekskill NY. The floors are creaky, the lights are low, there are nooks and crannies and a surprising number of people dashing in and out, bits of art stuck on here and there, a phenomenal fantasy & sci-fi section, and a real feeling of time settling into the corners. Peekskill is a good town, and Bruised Apple is its crown. #26: Caliban, Pittsburgh PA. A fine selection, though it cannot go unsaid that its future is in doubt and its past has had significant shade cast over it after news of unsavory practices by the owner. However, the employees are blameless and effort is being made to prevent Pittsburgh’s best bookstore from shuttering. The ground floor has some wonderful and surprising books for fair prices and don’t miss the paperback basement. #25: Dooryard Books, Rockland ME. The wind off of the sea seems to blow past every other shop in Rockland and store itself up in here. Naval books and high-sea adventures; culinary cookbooks from the 1950s replete with jello salads; hundreds of beautiful hardcovers of classic titles etched in gold threads on the binding. I have never left without wishing I could have taken another dozen books out the screen door with me, nor have I left the salty sea air to hang in the store without regret. #24: South Congress Books, Austin TX. Good, solid Austin bookstore. There’s stiff competition for best bookstore in Austin but this is just too well-curated to leave any doubt. #23: Sacred Heart Religious Goods, Marquette MI. Tucked away from the main drag in Marquette, one can forget Lake Superior hovers just down the road. This enormous basement has, by leaps and bounds, the best selection of Catholic books I’ve found in the country. The Upper Peninsula is not easily accessible, but if you’re in the area this is (at least) as well-curated as the selection at the National Basilica, and the owners are full of stories about Catholic Marquette. #22: Cellar Stories, Providence RI. Providence has at least 2 first-rate bookstores; Symposium easily could have made the list as well. They’re reasonably close by one another, and Cellar Stories’s selection alone will fill a day-long visit. #21: Skylight Books, Los Angeles CA. 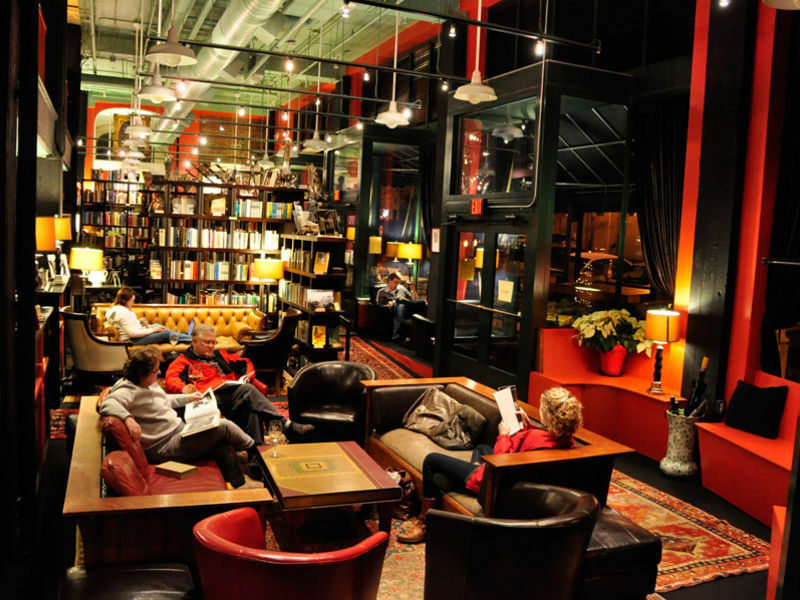 While this list emphasizes used bookstores, Skylight’s selection is too fine to ignore. Yes, there are some notebooks and cards designed to move quickly, and they do because they’re genuinely unusual. The real sell is their visionary curation. I have rarely encountered a medium-sized indie bookstore willing to take risks, which means not just stocking whatever’s on the hipster-darling lists. #20: Rhino Books, Nashville TN. Good couches, good selection, good location, great employees, manages to keep a supply of usually hard to find underground classics and mixes them with dependable classics. I like that it’s been around for awhile and has a steady quality that roots the neighborhood. #19: Elliott Bay Book Company, Seattle WA. Another indie bookstore in a city overflowing with excellent bookstores, but the quality is, like Skylight, too good to ignore. Almost overwhelming in terms of its selection, it is also remarkable for the airy and wooden atmosphere which pays fitting tribute to the Pacific Northwest. A very pleasant place to sit and browse. #18: The Last Bookstore, Los Angeles CA. This place has some of the weirdest books I’ve ever found, things I could never have dreamed up, and it’s affordable too. Located in downtown Los Angeles, it’s reminiscent of an art-gallery situated at a crowded intersection. It doesn’t seem like it should be conducive to browsing, but the whole thing ends up working very well. #17: Battery Park Book Exchange, Asheville NC. It’s not the first bookstore to mix wine, food, and books, but no place does it more beautifully. #16: Raven Used Books, Cambridge MA. Here are the books Harvard grad students and professors no longer need. Less popular than academic, but it’s full of things you won’t find anywhere else. Harvard’s bookstore is wonderful, but the Raven carries those things which, while less profitable in the moment, have a peculiarity which is irreplaceable. #15: Carmichael’s, Louisville KY. An exclusively new-books store has to be special to make it on here. Carmichael’s is special. Every inch of the space is given over to something worth checking out. Traces of the Wendell Berry worldview work their way into the fabric of the store, manifesting on shelves full of tomes of guides to the thrifty, recycled, handmade life. The mixture of the practical with the beautiful makes this one of my favorites. 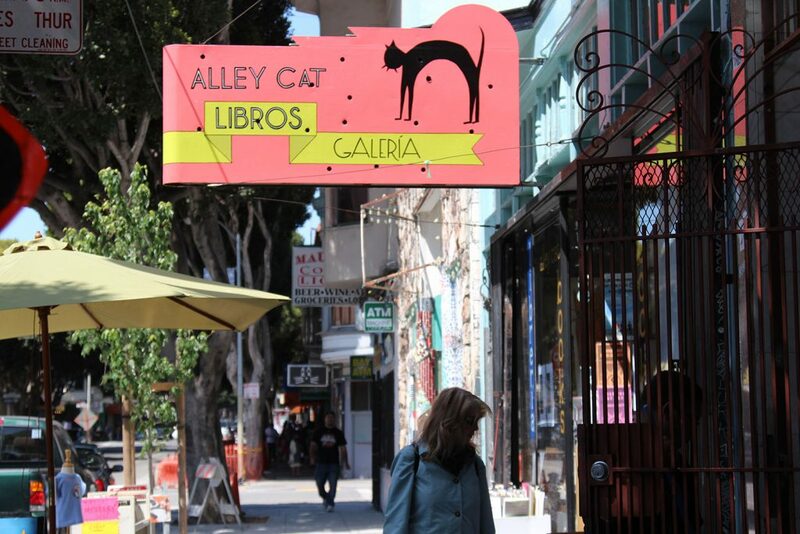 #14: Alley Cat Books, San Francisco CA. 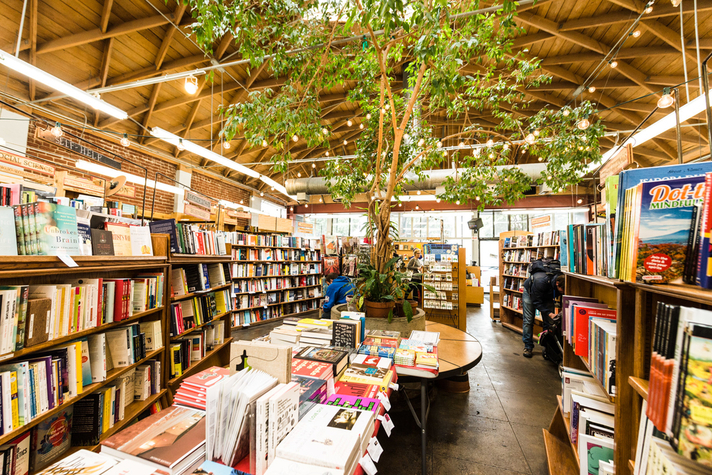 The whole Bay area is good for books; perhaps the best in the country (and yes, it is frustrating that a city which is part of the creative disruption movement has managed to keep so many of its own bookstores). Alley Cat just has really stuffed the sections I find most interesting with authors usually difficult to find. Terrific. #13: Seminary Bookstore, University of Chicago, Chicago IL. A stellar selection, though it is also expensive and stocks no used books. When budget requirements cause existential crises as you attempt to winnow down your final purchase list, you know it’s good. It would just be nice if it was a little gentler on the wallet. #12: The Book Lady, Savannah GA. Flannery O’Connor is everywhere. It’s wooden, gentle, surrounded by live oaks, mixes the old with the new, and has small nooks and threadbare chairs. It’s everything a bookstore in Savannah should be. #11: East Village Books, NYC. The bookstore situation in New York is distressing, let alone the used bookstore scene. Please protect this place, which thumbs its nose at conforming to the eternally spotless mind of a Manhattan which has taken Marie Kondo a little too much to heart. Also, bring cash. They get a little surly if you want to use a card; the surliness is part of the joy of the place. #10: Powell’s, Portland OR. Yes, everyone loves Powell’s. Yes, it has to be on here. Yes, it deserves heaps and heaps of praise. Why isn’t it number one? Because it has too many damn books and it’s not pleasant to rage-run between floors because there’s not enough time, never enough time. #9: The Iliad Bookstore, North Hollywood CA. This place is great. Sunny, colorful, good popular section, good art section, good literature section, funny crates with who-knows-what: it’s just a happy beam of light. #8: Capitol Hill Books, Eastern Market DC. Washington DC has some fine indies, but this used bookstore in Capitol Hill is the best bookstore in the city. It’s a relief to hear here are plans in place to maintain the character of the store as the current owner prepares to step down. Browsing in the basement is a bit frightening, cave-ins seem dreadfully and wonderfully possible. Three floors of jammed delight. Don’t forget to look behind the books visible on the shelf when you’re upstairs; there’s usually at least one other layer behind them. #7: West Side Book Shop, Ann Arbor MI. Over the course of my half-dozen long visits, scattered over the past 6 years, the owners have shown themselves on each occasion to be helpful, kind, generous, and eager to draw maps to their other favorite bookstores in town. The selection is marvelous, the books themselves are beautiful simply to behold. A reminder of how fine old books can be. #6: John K. King Books, Detroit, MI. This is one of the saddest bookstores I’ve ever been in; walking up the cold stairs with snow blowing in, standing in a lonely corner on the 5th floor, turning on a bare bulb to peer at the wreckage of a dream. It approaches Powell’s in size, but what we have here is stuff that seems scooped out of the abandoned homes of Detroit. It should be featured in a National Geographic spread: what happened here? But within this sad strange cavern, the books witness. #5: Normal’s, Baltimore, MD. Baltimore may have the most under-appreciated bookstore scene in the country and certainly the best in relation to its size. And it seems to be improving by the month which is what is really exciting. 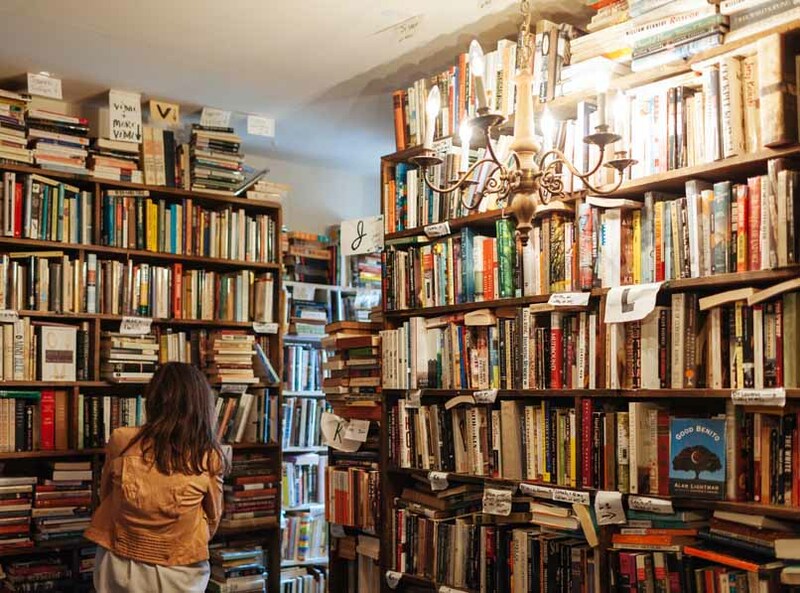 You’ll get more out of a day spent book browsing in Baltimore than almost anywhere except Berkeley or Ann Arbor, and Normal’s is the crown jewel. It’s good weird Baltimore, unlike anything you’ll find elsewhere. #4: Dawn Treader Bookshop, Ann Arbor MI. I suspect Ann Arbor must have the strongest bookstore scene in proportion to its size. Sometimes there’s not much to say about excellence other than: it’s excellent. #3: Chop Suey, Richmond VA. New books downstairs, used upstairs. Curation on both is terrific. The owners seem to actually be having fun with what they do; at one point there was a room that seemed like a museum piece with some dabbling in taxonomy; a fitting hobby for the used bookstore owner. The used fiction room on the second story has tall windows overlooking Cary Street and the room is always filled with natural light which is much better for browsing than artificial LEDs. Most importantly, I value a bookstore with deep philosophy, history, and religion sections. That’s rapidly become a struggle but Chop Suey is a wonderful aberration to the trend. #2: Wonder Books, Gaithersburg MD. Home to the beloved and decrepit green carpet which inspired this list, Wonder Books is a testament to a business’s ability to forge a path which does not erase the past in order to grow into the future. It was formerly known as Book Alcove, and I was shattered when the owners sold it in the mid/late 00s. It was a sprawling disaster, and it must have seemed impossible for the new owners to not gape in horror at the prospect of doing inventory. The whole thing was the total embodiment of the administrative mind’s most dreaded word: inefficient. It was and remains a labyrinth where as a child I ran in loops, got stuck in dead-ends and spun around until I was delightfully and genuinely lost. When it was sold we all feared the idols of modernity would wreck it all in favor of something more manageable. The texture, the smell, the murky atmosphere would be rendered clean, cold, bloodless. It’s to my everlasting gratitude that, despite being situated in Montgomery County MD, this did not happen. Wonder Books is an ode to a world that reason says shouldn’t exist anymore, where things aren’t valuable only because their covers are pristine. It’s a world where Nooks and Kindles are the fleeting butterflies but Arthur Rackham collections and Iris Murdoch and battered versions of Sigrid Undset’s novels endure. #1: Labyrinth Books, Princeton NJ. If you recall Micawber Books, which preceded Labyrinth in its current space, you may at first be hurt by the change in atmosphere. Micawber was what Barnes & Noble wanted to be but was too big to achieve: it was lovely, like one imagines an old London dining club. A top hat would not have seemed inappropriate. Labyrinth, on the other hand, employs jarring lighting, linoleum floors, curt folding tables, and plaster walls. There is no space for romance or sentiment. There are university bookstores which don’t so much resemble a strip mall t-shirt warehouse. It is thus a testimony to how phenomenal the selection is that the atmosphere of Labyrinth cannot cast a shadow of doubt about it being the highest-quality bookstore in the country. I have seen nothing to surpass it. There are much bigger bookstores. More expensive bookstores. Shinier ones, quieter ones, bookstores which aggressively cultivate their personalities. Labyrinth is the heavyweight. They exist for books and are not interested in window-dressing or sentiment. 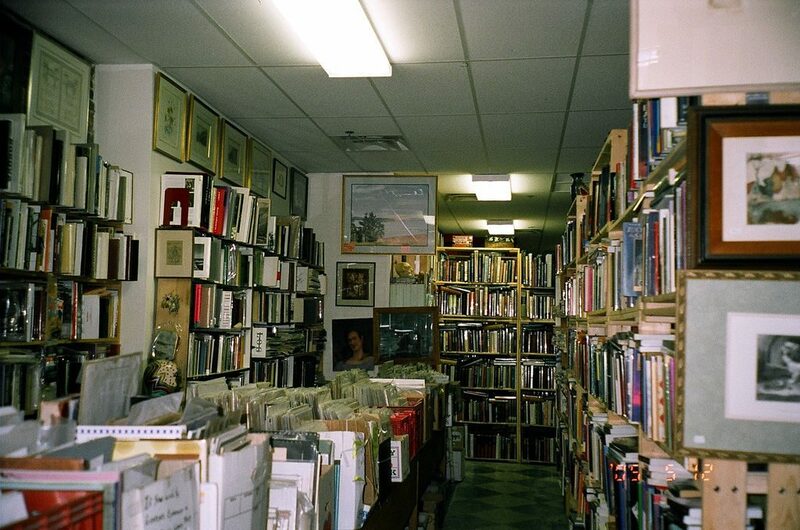 The result of their mixture of new and used is that the front of the store is given over to new releases, often ones impossible to find elsewhere, while the back of the store stocks classics and relies on the surrounding community of professors to preserve rarities that would otherwise disappear. If you’ve never visited Labyrinth, please catch a train or drive however far you need to drive. Plan on several trips over a long weekend; give yourself time to reflect. But you could visit every other bookstore on this list, and I’d still say you’re missing out. We’re lucky to have Labyrinth, and one hopes it will serve as a model for other independents. Letterpress cards are nice, but take a risk and trust your customers: build a bookstore that offers what is new alongside what is old, and thus carry on the highest mission of a bookseller, to preserve a space where we learn who we are, and how we found this world. The question is, do you want a bookstore that is a garden, or a wilderness? A classic out-of-print bookstore with deep sections in all that is unfashionable. The place where I passed up a first edition of William Cobbett’s, Rural Rides, because it was too expensive! What kind of silly brainless excuse was that? Even today, twenty years later I have bruises from a regular kicking of myself. It is still one of the first places I visit when in town. Jack of the Wood pub running a close second (also a convenient block distant). Seriously, a fun list that I look forward to checking off as I visit. I’m in and out of Michigan a lot and have never ventured into Ann Arbor. Now I have reason to do so. You know, I was thinking about changing the Asheville entry. I spent one very lovely evening with my husband in that bookstore and so it is a little sentimental with me; and that’s part of the “logic” of this list: sentiment counts. Similarly, I’ve visited some risky and unique bookstores in small towns around the country, but in the end the ones I’ve known best are in the large cities or boutique towns: the very trend I’m criticizing. So to revisit the Asheville question, if I were a little more ruthlessly honest with myself, I’ve bought far more books at Malaprop’s. I only made it to Captain’s, rushed, on the last hour of my last trip to Asheville, and at the end of a trip, having already spent the pocket allowance, things make less of an impression. To find William Cobbett in an actual, physical bookstore, that’s never happened to me! I must make it back there! Still, it was a good visit to Battery Park. Ah, Malaprops. I truly love an out-of-print bookshop best. But, they are a top contender for a well-curated independent bookstore. I love perusing their employee picks, a cut above most such shelves. I passed through Wichita in a snowstorm one evening and did not wish to risk traveling in increasingly treacherous conditions, and this is why I have yet to visit the famous Eighth Day Books. Ahem. No disrespect to the sainted Warren Farha, whose Eighth Day Books has contributed enormously to the creation of many beloved, bookish moments here in Wichita, KS, but this city is the home of two superb independent bookstores. I speak here of the vital Watermark Books. Given the author’s invocation of moss and ripped seams on chairs, I suspect that she’d be less than impressed at the way Watermark has been obliged, for reasons both within and without their control, to compete and update in line with the shifting economies of bookselling today (it goes without saying that socialists and conservatives and bookstore lovers alike all would prefer it if the marketplace was tad less disruptive and creative in its destruction; maybe we could start voting that way, perhaps? ), but if the basic premise is to search for “a landmark of our spiritual, emotional, and mental lives,” then I assure you: Watermark is a gem. Books In Stock in Wooster, Ohio is a very good used bookstore. Great selection, fair prices, well organized, and located in the lovely “downtown” area of a small college town with lots of other interesting stops — a couple nice antique stores, a record shop, several good restaurants, etc. It’s the kind of place where you can park your car and leave it for the day, because everything is pretty much within walking distance. It’s a two-hour drive for me from Pittsburgh, and I’ve made the day trip four or five times since I first discovered it late in 2016. Beautiful stories! I took a “summer job” at Book Alcove when I was very young. It’s owners nurtured me. My future changed that day. It has been a book life ever since. I couldn’t let Book Alcove disappear if it could be prevented. If you want to read the whole story see Saving Book Alcove on the wonderbookblog.com – there’s still bits of green carpet here and there. I’m glad that you included Rhino Books in Nashville, but you should also have included Elders, which has the best selection of southern and civil war history anywhere, as well as literature. I’ll second Malaprops and Watermark. Was able to obtain Hugh Warwicks Linescapes at Malaprops. Enjoyed being in Prosperos in KC quite a bit and slight favorite is Taylor’s in Charleston WV. Liked Left Bank in St Louis. Thanks for the list. Oh, found a great place called Old Scrolls near Canadaigua on a bike tour. Found an old copy of the Great North Trail there. I suppose all that exist now are old copies. Same tour I walked away with Keats Collected from a great place called the Otto in Williamsport PA. My sense of Eighth Day on my brief visit was that it’s kind of incorporeal, in that what made it was the community which has formed around the place. Some bike shops are like that. Oh, picked up a fascinating book, Arts of living on a damaged planet at Tattered Cover in Denver. And a good cookbook. Two other wonderful locally owned bookshops that did not make the list are Village Books in Bellingham, WA and Hearts and Minds Books in Dallastown, PA. Like you mention above, sentimentality–in its appropriate and not too saccharine form–counts, and perhaps these two are sentimental favorites of mine. I should probably also mention Lucy’s Books in Astoria, OR as well. https://www.villagelightsbooks.com/ in Madison IN. The owners are book lovers of the first water and the store is a treat. You forgot The Strand in NYC. Over the years I visited Magina’s, founded by George Magina in 1948, at least once a month and never left disappointed. It wasn’t very, big but it wasn’t all that well organized. Gems could show up in the strangest places. During my summers in high school, I would spend two Saturdays a month making the 2 1/2-mile roundtrip walk to the store, determined not to leave until I found a good book. It might take 2 hours or more, but something always turned up. I moved from Lincoln Park in the early ’80s but stayed in touch with George on my visits home. He died at 78 in 1986, and his son, Steve, took over the shop. Like his dad, Steve was a great guy who knew tons about books. Unlike his dad, he was highly organized. There were still gems in the store, but they were properly shelved — and, even worse in my view — properly priced. Hidden treasures were no longer to be found. To the distress of all who knew him, Steve had a fatal heart attack in August 2017 while mowing the grass on the vacant lot next to the store. His wife and children don’t want to carry on the business, and the fate of the store and its glorious stock is still unsettled. Glad Steverino added The Strand. How could you leave out Haslam’s, St. Petersburg, Florida? I’ll see your list of 40 and throw down Haslam’s in St. Petersburg FL . 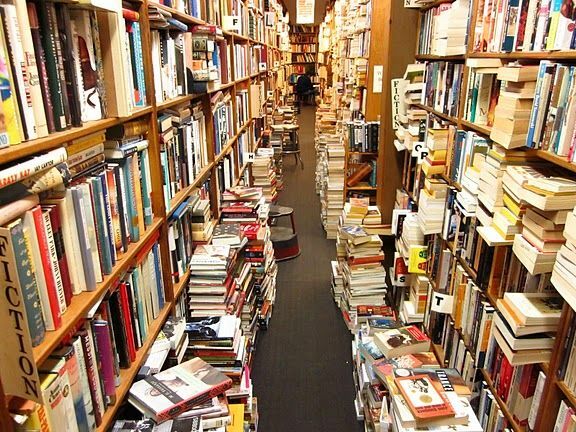 The Last Bookstore is a paradise…but no bathroom. Judging from myself only, If they would just install one, they would triple their sales; every time I’ve been there the only reason I’ve left is because my bladder couldn’t take it anymore. Upstate New York is loaded with great used and antiquarian bookstores. Lyrical Ballads in Saratoga Springs, Willis Monie Books in Cooperstown, Rodgers Book Barn in Hillsdale, Catnap Books in Cobleskill, Down in Denver Books in Stephentown, W. Somers in Schenectady and my own, the Book Hound in Amsterdam, just to name a few. All of these stores have been gathering moss and preserving the past for more than a quarter century.